We chose a dynamic material palette of encaustic concrete tiles for the floor and locally hand-made ceramic tiles for the walls. 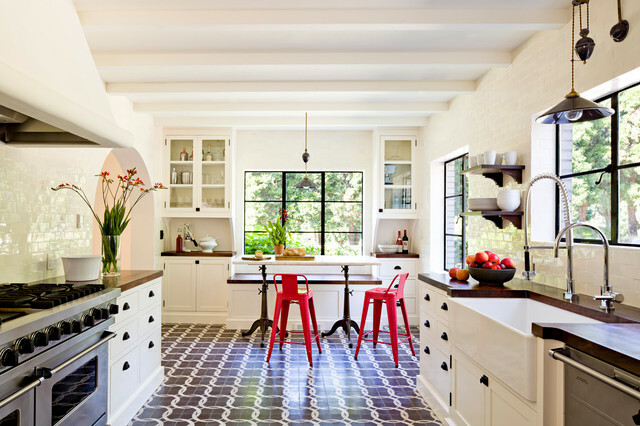 Painted, rough-sawn beams create visual interest on the ceiling. The counters are solid, thick walnut slabs from locally felled trees. Where can I find that floor tile? I love it! Someone bought them, I'm afraid. I was really sorry not to be able to use them. We did use some other cement tiles from Granada and they look fantastic. The people there are nice to deal with too. My boys love these counter weight pendant. Who makes these and where can I purchase them. Thx. Did you get an answer on the lighting fixtures? I love - where can I buy? where do you buy the chairs? We didn't provide the windows on this project, but you may be interested in our similar line of Renaissance Solid Bronze Windows and Doors. 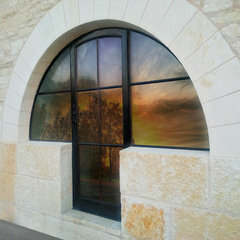 Our solid bronze windows offer affordable luxury with narrow sight lines, high strength, and low maintenance. 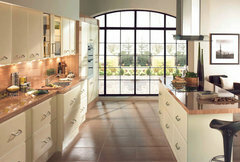 All of our windows come fully glazed with triple seal glass & mounting flange options for installation. Windows - Can you tell me where is can find windows like this in Portland? I would love to know the cabinet color! What is the white paint color? what are the countertops made of? 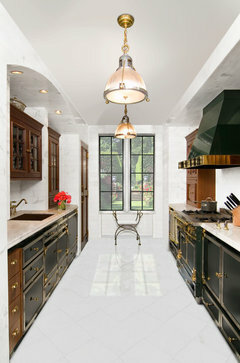 Hi Jessica, I was wondering if you could tell me if you used new cabinetry or had the originals redone? what is the floor made of? thank you! What type of counter top is this? Love the "bistro style" table. Where could I get one? - Looks like a drafting table with a marble top? But love the clean, unfussy lines of it. Source of beams and paint color?